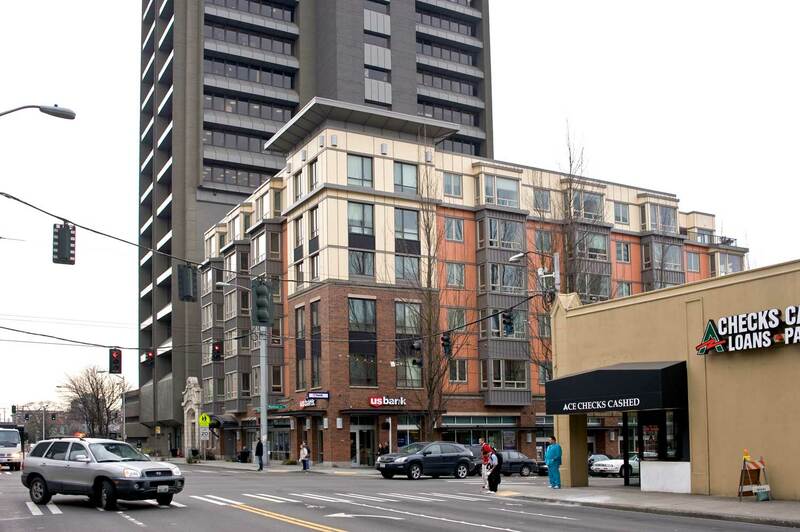 NOW: In a humble irony, the southeast corner of Madison Street and Boren Avenue which was first developed as a lordly home site for Federal Judge Cornelius Hanford, his wife Clara and their eight children is since 2006 home for 50 units of affordable senior housing developed by the Cabrini Sisters. 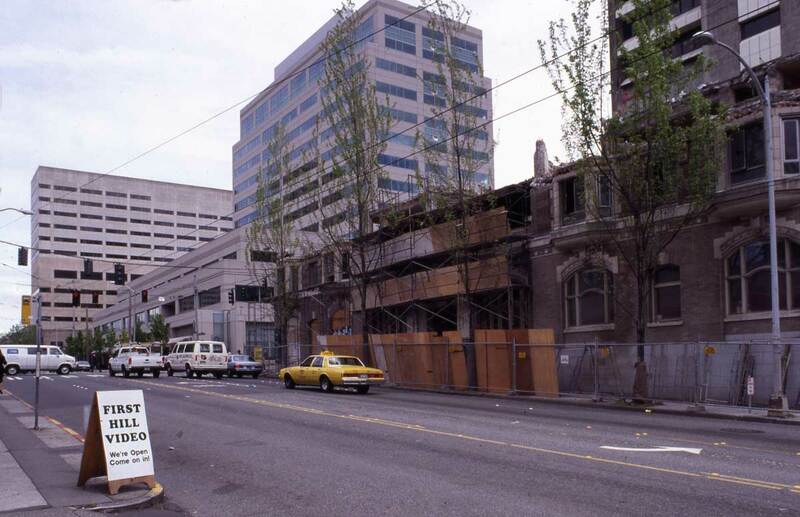 The Perry/Cabini structure was torn down in 1996. While supervising the construction of the prestigious St. James Cathedral, architects Marbury Somervell and Joseph S. Cote, both new to Seattle, became inevitably known to new clients. Their two largest “spin-off” commissions were for Providence Hospital and these Perry Apartments. The Perry was built on the old Judge Hanford family home site while the Cathedral was still a work-in-progress two blocks away. 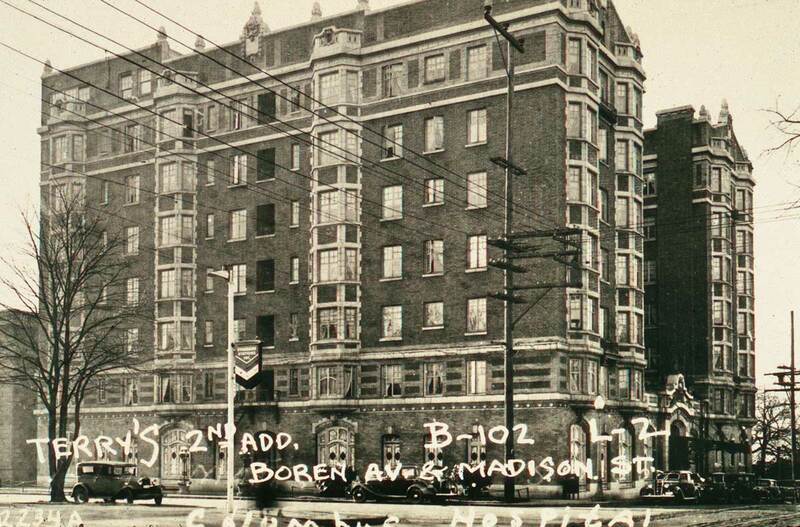 St. James was dedicated in 1907 and the ornate seven-story apartment was also completed that year for its “first life” at the southwest corner of Madison and Boren. In this view the new Perry is still eight floors of distinguished flats for high-end renters who expect to be part of the more-or-less exclusive neighborhood. Neighbors close enough to ask for a cup of sugar include many second generation Dennys, the Lowmans, Hallers, Minors, Dearborns, Burkes, Stimsons, Rankes, and many more of Seattle’s nabobs. Most importantly class-wise were the Carkeeks. 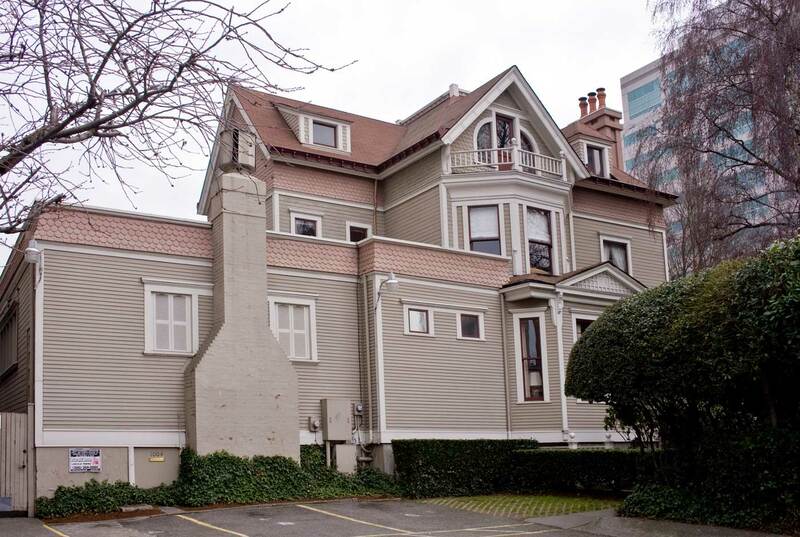 In the mid 1880s the English couple, Morgan and Emily Carkeek, built their mansion directly across Boren Avenue from the future Perry when the neighborhood was still fresh stumps and a few paths winding between them. The Carkeek home became the clubhouse for First Hill culture and no doubt a few Perry residents were welcomed to its card and masquerade parties. Aside from the trolleys that ran between a waterfront turntable on Western Avenue and Madison Park, Madison Street was ordinarily quiet. Most citizens either walked or used the trolley. The motorcar, far right, is a rarity in this ca. 1909 scene. 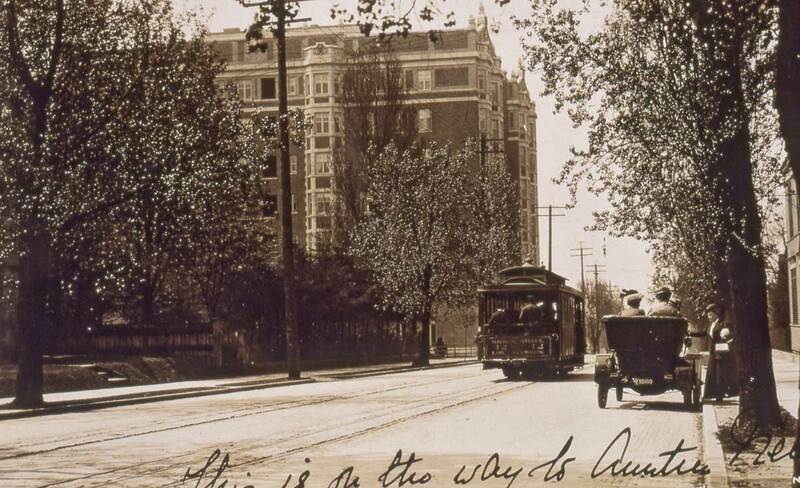 The view looks west towards the Perry Hotel on the far side of Boren Avenue. The next postcard scene looks in the opposite direction from the hotel’s corner, east on Madison Street. 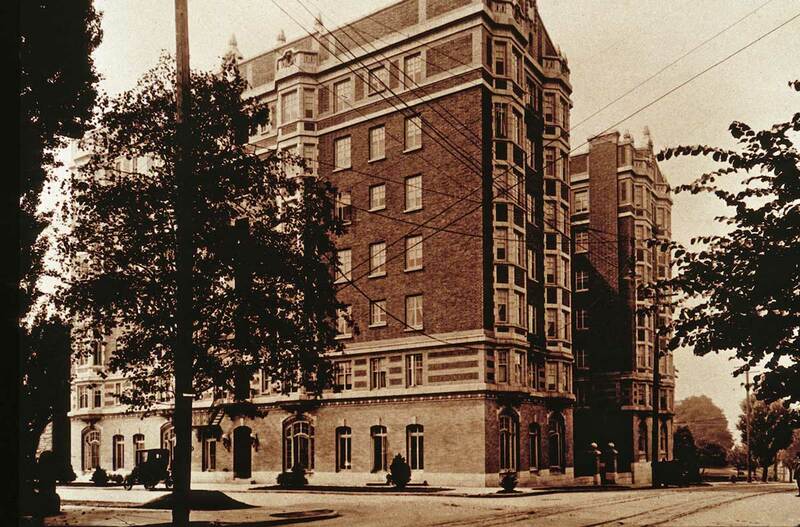 The Stacy Mansion – later the University Club – is on the far left. The wrought iron fence on the right closes the grounds of Morgan and Emily Carkeek’s Mansion from the sidewalk. Perry Hotel, ca. 1912. 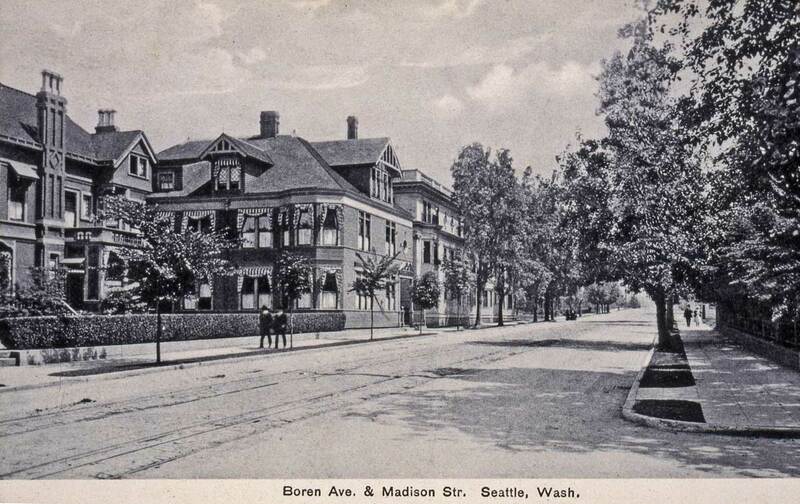 View looks west on Madison Street across Boren Avenue. 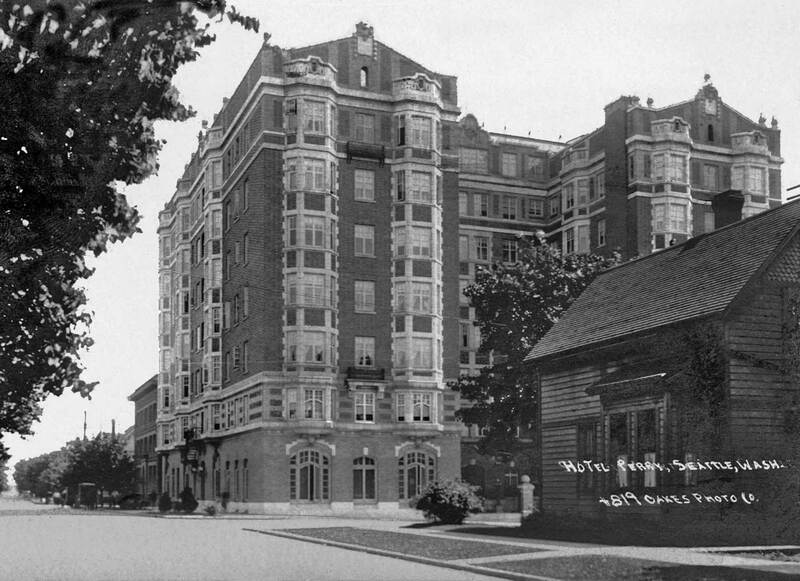 With the Perry’s sale to the Catholic order the hotel became first the Columbus Sanatorium and later the Cabrini Hospital. 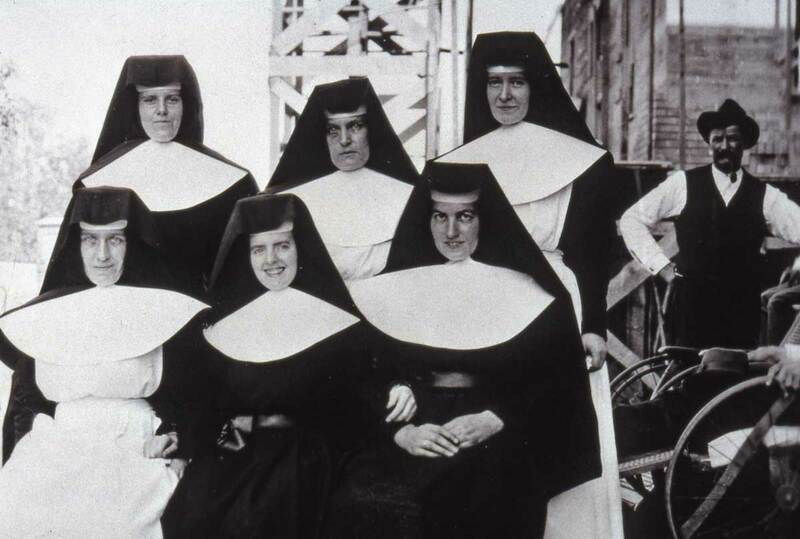 Below are six posing Cabrini nurses and below them is a late 1930’s tax photo of the hospital, used compliments of the Washington State Archive. Work-in-progress on razing the nearly 90 year-old hotel-hospital. The original slide is dated May, 1995.